The Aspire K3 Starter Kit is perfect for beginners due to it's simple design and minimal function while still providing great flavour and vapour at an affordable price. 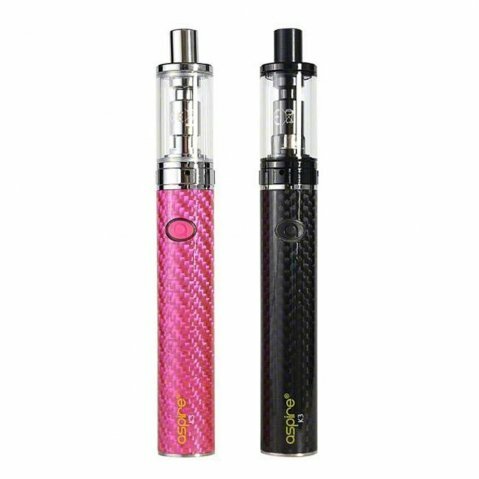 The K3 Kit consists of the Aspire K3 Battery paired with the Aspire K3 Clearomiser (Tank). The Aspire K3 battery is a 1200mAh battery so when fully charged the user should get around 11-13 hours on one charge, though this can change depending on how much you use the battery, how many times you turn it on and off etc. The battery firing button has a 5-click system to turn on and off and if pressed for too long (around 15-20 seconds) the battery will turn itself off, this is to prevent overheating and burning your coil out. The battery also has a charge indicator surrounding the firing button that lights up when the button is pressed. This light shows orange when the battery has a lot of charge, just blue when it is half charged and blue and orange when it is low charge and needs to be plugged in. These lights also appear in this way when the device is charging. The K3 Battery is pass-through so you can vape the device while charging. The charge port is located on the bottom of the battery. The Aspire K3 Tank is a 2ml mouth-to-lung tank (meaning it simulates smoking a regular cigarette) with airflow holes for improved pulls/draws, though these are not adjustable. The tank is filled from the bottom and the coil is changed from the bottom. The K3 comes with a pre-installed 1.8 Ohm BVC Atomiser (also known as a coil) as well as a spare for when the first one is ready to be changed. To fill the tank, unscrew its base and pour your e-liquid down the sides of the glass. Avoid pouring e-liquid down the hole in the central hole as this can cause leakage and make sure your e-liquid level does not go over the centre tube as this will also go down the central hole. After filling the tank, screw the base back on and leave it to stand for 5-10 minutes to allow the e-liquid to properly soak into the cotton within the coil. If you do not leave it to soak for long enough and go straight into using the device, the cotton may burn and the coil will be ruined. Coils are a disposable items that need to be changed on a regular basis. They last anywhere between 3-15 days, and while the average is 7+ days, it does depend on how often you use it; a lighter vaper may get longer out of their coil than a heavier vaper. When your e-liquid begins to taste burnt, your tank is starting to leak slightly, or the tank is no longer giving you any vaper, it is time to change your coil. To change the coil unscrew the base of the tank and unscrew the coil (the metal cylinder sticking out the base with 'Aspire BVC' etched on it) then screw in a new one. These are sold separately here as a pack of five for £11.99 or here as a single coil for £2.99.